Utopia is Utah's large-scale municipal-broadband project. My city, Lindon, was one of the first supporters of the project and all winter I've watched in anticipation as crews dug up the lawns in my neighborhood laying fiber. I first heard about Utopia when I was Utah's CIO and Utopia was just a dream Paul Morris had. I've supported it, written about it, testified about it to city councils, and, mostly, waited for it. Yesterday was the day that I had service installed in my house. To understand the overall situation, it's important to realize that Utah law doesn't allow municipal broadband projects to compete in the retail space. So Utopia is an interlocal agency (i.e. government agency) that provides wholesale FTTH (fiber to the home) services. Retail service provides compete to provide the actual service. So getting set up involved signing up with a retail company, but getting the service involves having Utopia and the retail provider both install things in the house. There are currently four retail service providers on Utopia. MStar, Nuvont, and Veracity Communications offer full triple-play bundles (Internet, TV, and phone). XMission (Pete Ashdown's company) offers Internet service only, I believe. I chose MStar for a very pragmatic reason: they gave it to me free. So this is my disclosure: I'm getting free service and writing about it. The install process was pretty interesting to watch. Since my home is relatively new, I have Cat-5 run throughout the house, so the in-house installation (MStar's job) was a breeze. Here's a picture of my patch panel in my basement. Getting the fiber from the place where the install crews left it this winter into my house was a larger job. I took pictures. Of course, once this is done for a house, you'll never do it again unless the fiber gets damaged. The FOSC, or fiber optic splice closure, is a watertight plastic container that lives in a ground box about 1000 feet from my house. The installers did a single fiber pull from the access point in my basement all the way to the FOSC. They spliced the fiber at the FOSC and again in my basement. The access point is an Allied Telesyn Multiservice Gateway (AT-iMG606BD) that costs about $500 new on the Internet in single lot quantities. There are six RJ-45 jacks on the side: one for phone, one for network, and four for TV. After it was installed, I just plugged the network into it and it worked. Same for the TV and phone (MStar supplied a Linksys ATA and Minerva set-top boxes). I'm not a big TV watcher, but I've enjoyed the HD programming, mostly for the wow factor and the other channels have been clear, like you'd expect. I haven't used the phone a lot, but it seems just as good as my Vonage line. How fast is the network? It's fast. The package I have is advertised as 15Mb/s symmetric (i.e. 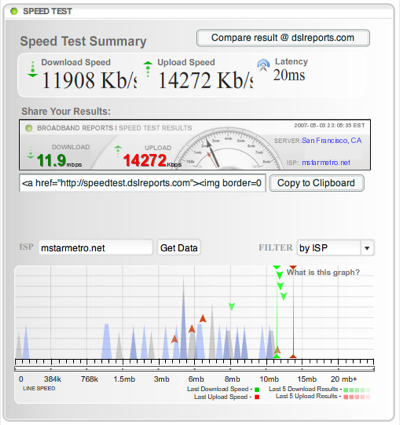 the upload and download speeds are the same, unlike DSL and cable). The cost for just the Internet service from MStar is $40/month. Not too bad for that kind of speed. Note that I'm only seeing 12Mb/s down, but almost 15Mb/s up in this particular test. I also did some large file uploads and downloads. in real life, you don't see these kinds of speeds because of bottlenecks at the server and throughout the network. Still, I see noticeable improvements in downloading large files, like these videos of talks from Pop!Tech. Web pages also just seem to "pop." It's very cool. Of course, if you want, you can order more bandwidth. Still, having the equivalent of 10 T1's to my house is something I wouldn't have dared dream about five years ago. Overall the install process was smooth and professional. The service, at least for the day I've had it, seems good. One minor quibble: the MStar service techs didn't leave behind anything at all with any kind of account information. To be fair I was rushing them because we had to go somewhere. I'll let you know how things go.